Is the Beeb running out of ideas? My son Christopher alerted me to this Kickstarter project with a difference. It's a great project in Vienna, Austria which is going to be a great piece of equipment for portrait photographers. Its only been up for a couple of days (according to the Kickstarter Page) and is already nearly 6 times oversubscribed. I think it's partly due to the great video they made to explain the project. Good luck to them. This is clearly going to succeed. So how hot is it with you? It's 35 degrees outside my office window. That's why I'm running a tropical roster at the moment...Getting up at the crack of dawn to be able to take a few hours off at midday when it really starts to boil. Luckily this video of all the events taking place at High Tech Campus Eindhoven is really cool. Indeed it is the ecosystem and network that makes these campuses unique. You can copy buildings and procedures. But the mix of people is unique. And startups that get in to Startupbootcamp HightechXL in Eindhoven get access to a wide range of events being planned just before, during and after the program. The hot weather is no distraction for the great conversations we've been having with teams applying for the Startupbootcamp HightechXL accelerator program. 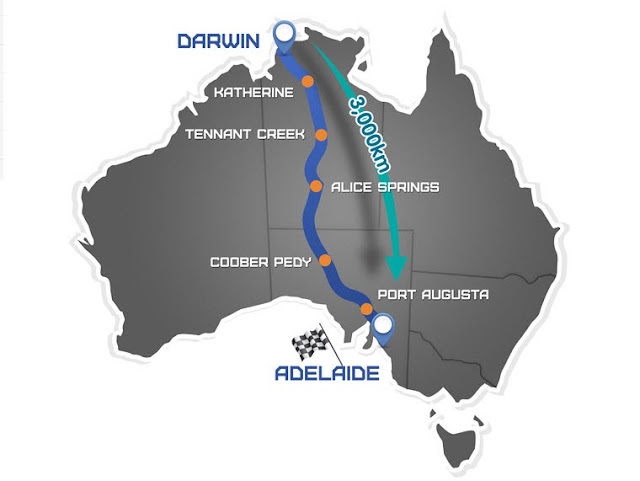 We're talking with teams all over the world as the on-line deadline for applications is fast approaching. In my conversations with early startup companies, I realise that there are big differences between the world of app development and those involve hardware in their solution. As you're out there searching for the sustainable business model, as Steve Blank would say, it's much easier to tweak a line of code rather than rebuild a piece of hardware. Which is why the HightechXL programme is fine tuned to the needs of high-tech companies. Bart Lugard is in charge of our global search for teams. "Of course, in high-tech, we’re looking for strong teams that have more than an idea. The winning teams will start the program on November 11th with a proof of concept or technology proof of principle. Ideally, they should have a demonstrator or a working prototype. A friend of mine put it like this. The prototype should have reached a stage where if it drops on your foot, it would hurt! What he means is that paper plans are not usually enough." "We have had questions from companies who are specialising in software only. But in each case this software is somehow connected to a piece of dedicated hardware. Like a vehicle. Or a specialised sensor, or a robot." It is important to understand that during the three months we will not focus on developing the technology any further. Instead, we use the time to fine tune the business model, validate the customer base, engage with lead customers, sign up pilot projects as well as prepare a world-class investor pitch for Demo Day. Others have described our program as building a real-world business strategy. It makes a lot of sense to sign up today because late comers often lose out! Stand out from the others. Remember many applications at an accelerator program come in during the last week before applications closing. Our advice is to apply early, even if you have not yet finalised everything (like getting a video pitch ready). Fill in what you can and consider applying for one of the on-line pitching sessions. That's a great chance to ask open questions to the program organisers and some of the lead mentors. They may come back with advice and suggestions that can improve your chances of getting selected. You still have time to tweak the application. In the period from 6 to 2 weeks before applications close (i.e. that means July and August 2013), the program management and their mentors usually have more time available. Our team in Eindhoven is watching the incoming applications and may already approach you for an initial conversation. Remember, they can only do this when they know you are applying for the program. Finally news that we're arranging Pitch days right now. Sign-up first in order to take part. · At Startupbootcamp HightechXL, we’re setting up a days in August for Open Pitches, either in person or via Skype. Those who have applied early have encouraged us to continue with this great opportunity to learn more about applicants and watch their progress. · Technical tip: Make sure you have a reasonably fast/stable Internet connection before trying to pitch over Skype. · Remember, the closing date for on-line applications for the Startupbootcamp HightechXL 2013 program is September 8th 2013. That's a firm date because we want to be fair to others. Don't leave it until the last minute! This Russia Today documentary is an interesting outside looking in perspective. Life in the West of Amsterdam is indeed another world and I fear the focus is on what divides people rather than what brings them together. Will NY startups head for Texas? Lewis Black and New Yorkers have a rather rude response to Texas governor Rick Perry's attempt to lure businesses away from the Big Apple. Perry has been busy in Illinois and California too or a rather brash recruitment tour around the USA. Does it convince people? Probably not. It would appear he has more success is attracting smaller businesses away from the valley. Jobs don't seem to be going with them. And as comedian Lewis Black points out, nothing says cutting edge in the 21st century like taking an ad out on the radio. Do US startups even know what a radio is? Sorry to receive a notice in the post today that engineer and tech journalist Willem Bos has passed away in his sleep on Sunday July 21st 2013. He was just 66. Willem was one of the best HF antenna specialists on the planet. I originally got to know him in the 1980's when he was running a CB magazine from his home office in Nieuwkoop. He was a regular contributor to the NOS radio programme Hobbyscoop. He was always full of stories and after a few interviews became a regular contributor to our tech show on Radio Netherlands called Media Network. As CB disappeared, he became more involved in developing radio products for both the amateur and professional markets. He had the most amazing set of test equipment, I have ever seen and a clear vision on what made a good, low noise antenna. In later life he teamed up with a company in Hoogeveen to produce antennas under the brand name RF Systems. He appears in this programme from 1995 about 15 minutes in. Willem also collected Bakelite radios. At one point he had them displayed in the giant house he was living in a tiny village called De Steeg. It was a former school if I remember rightly. It had plenty of space for over 300 radios. Bakelite was an early form of plastic which brought radio to the people. When radios were first manufactured in the first twenty years of the last century, they looked more like an experiment in a physics laboratory than something which was designed to entertain. Then some firms started using a thermosetting phenol formaldehyde resin for their cases, formed from an elimination reaction of phenol with formaldehyde, usually with a wood flour filler. It was developed in 1907–1909 by Belgian chemist Dr. Leo Baekeland. Willem Bos had scoured the flea markets in the Netherlands in search of his passion for bakelite. 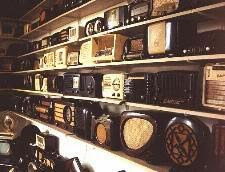 The Willem Bos bakelite radio collection. I went along with a microphone in 1998 to see the collection and made the following Media Network with him. He'd done all the research on the radios - and of course they had to work for them to be put on display. Great guy and a great friend of analogue radio. He will be missed. Thanks for all the stories Willem. Some people have asked me whether there is a modern day equivalent of Media Network, a programme which covers broadcast technology and journalism. There are a couple of programmes in the UK. BBC's the Media Show with Steve Hewlett and the Guardian's Media Talk. I personally prefer the Guardian podcast. I don't understand why Steve keeps referring to social media platforms like Twitter when he never quotes from reactions in his programme. 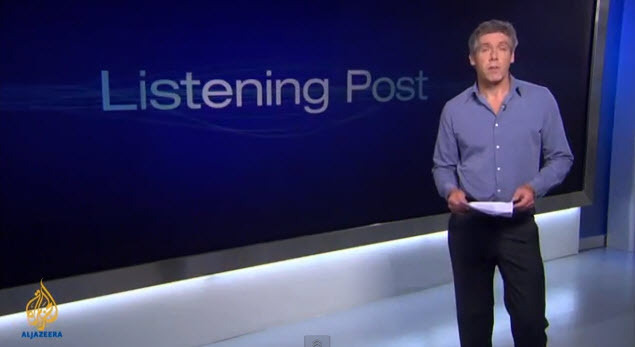 But I believe that Al Jazeera probably makes the best analysis of global media in a TV show called the Listening Post. It is expertly presented by Canadian journalist Richard Gizbert who is based in London The programme is slickly produced and probably the nearest equivalent of what we were trying to do in the 1990's at Radio Netherlands. You can find the weekly editions posted on Youtube. The latest edition covers a number of stations. I remember listening to Radio Cairo and wondering how such the centre of Arabic media could put on such a poor showing in foreign languages. What a missed opportunity. Now that I see the studios, I am beginning to understand why. 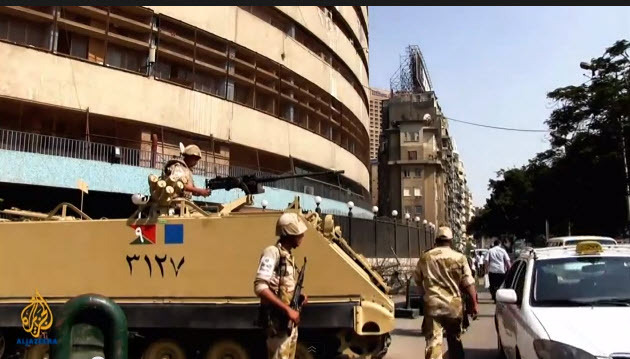 Having guns and a tank outside the window doesn't inspire creativity. 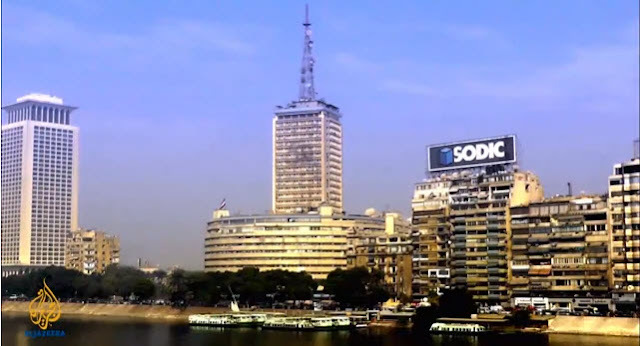 Welcome to government broadcasting in Cairo. 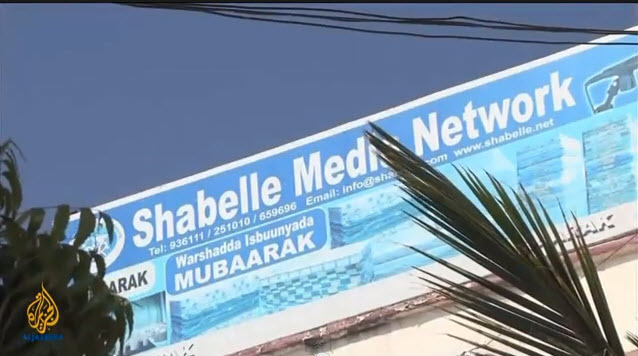 This edition also mentioned the kidnapped Radio Netherlands journalists Judith Spiegel and Boudewijn Berendsen in Yemen and changes to the media laws in Somalia which will curtail many of the media freedoms of networks like Shabelle Media Network in Mogadishu. I wish Al Jazeera would allow people to embed the Listening Post elsewhere. I can't see what could go wrong. Alan Partridge. Colossal Velocity or Alpha Papa? Norwich is set to be back in the news as from August 7th when the new Alan Partridge film is released after years of speculation. Steve Coogan is back in the studios of Radio Norwich it would seem. Wonder how the real BBC Radio Norfolk will react? They are on the first floor of the Forum in Norwich. And last time I was passing through Norwich station in January, there was a huge banner promotion Coogan's book. Guess the city must have a love hate relationship with Alan Partridge. He's a funny guy. But what does he do to confirm Norwich as a city you don't want to be? The Forum, with the BBC East and BBC Radio Norfolk in the first and second floors. Remember this great clip from Qi? Things have changed since Bill Bailey was passing through. The smiles have gone in customs. And the prices for food are just ludicrous. They used to be low and reasonable. Sign of the times. Be prepared for long walks especially if your plane leaves from the M or H terminal. And don't even think of bringing more than one carry-on bag. Don't brink back fake clothes or bags on your holidays. Yes, right. What on earth with you do with this plastic rubbish made in China? Good luck in customs the other end. The Guardian has just published a keynote discussion from their "Activate London Summit 2013". Its a conversation between Vint Cerf, vice president and chief Internet evangelist at Google and Jeff Jarvis, professor, CUNY Graduate School of Journalism. After a brief introduction, Jeff steers the conversation in the direction of online privacy, the internet of things, Google Glass, and the future of libraries. I have met and talked with Vint at several conferences. He is such a wise man and very approachable. He promised to follow-up on a suggestion I gave at LIFT in Geneva, and within days he had done just that, bringing me into contact with exactly the organisations I was looking for. So I find his thoughts and visions on what could happen next to be more than relevant when the media is all buzzing about privacy, Edward Snowden and his NSA revelations, and whether we can trust the cloud. For some reason the Guardian Media Network has not released this video for embedding, so you have to watch it on the Guardian site. It is here. Well worth the 18 minutes. 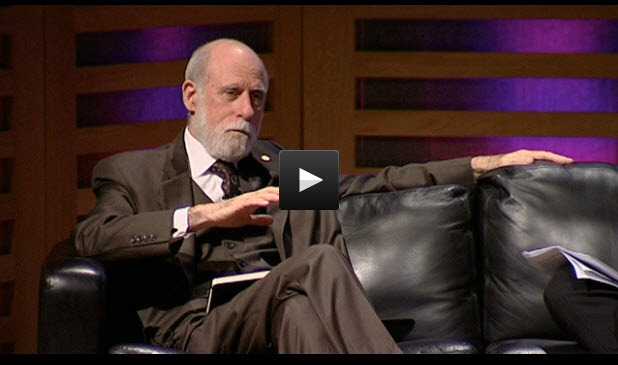 Vint Cerf also offers his perspective on re-imagining the media and government. May be the interview will encourage you to rediscover what Vint has said elsewhere recently. I also include the LIFT conference video where I first came into contact with the great man. Note how he stimulates you to think about what still needs to be done. The companies in Silicon Valley are still very much focussed on social and communications (mainly tablets and phones). What excites me about other places in the world, like Eindhoven. is what they are doing with the Internet of Things. As Vint explains in the Guardian interview. Passive Products are becoming active services. And the high-tech startups are the people really moving the boundaries. That's why I have become involved with Startupbootcamp HightechXL. It is clearly where both science and finance are converging. Because VC's are always searching for scalable ideas, in the one-billion dollar range, those teams working with both hardware as well as software solutions has a distinct advantage. Yes, the initial risk is higher. But so are the rewards. The Mother of All Demos is a name given retrospectively to the late Douglas Engelbart. Way back on December 9, 1968, he gave a demonstration of experimental computer technologies that are now commonplace. Like the mouse! The live demonstration featured the introduction of the computer mouse, video conferencing, teleconferencing, hypertext, word processing, hypermedia, object addressing and dynamic file linking, bootstrapping, and a collaborative real-time editor. And Steve Jobs was on 13 at the time this was made. It would be nice if someone made a version with modern graphics at the start. Is Earwax causing you to hear like an AM Radio? Nice Otex ad for the UK market. There are some real gems amongst the 1855 videos posted by Stanford University. Unfortunately, they are poorly labelled. That may be deliberate because they form part of paid college course. But if you're a startup, do spend the hour watching this excellent video from Howard Hartenbaum, who is a partner at August Capital. He explains why most startups don't need to even think about talking to Venture Capitalists....unless your company is going to be worth 4-5 billion dollars by 2020. In other words you have to prove that your company is capable of scaling fast...He also explains the different types of funding that is open to you - and why family and friends is never a good idea if you value those relationships. Part of a useful series. Not so many programmes from 1989 have survived because Radio Netherlands switched to a cheaper and rather inferior brand of recording tape. It was fine in everyday use, but it is didn't store well. As a result, many of my tapes in this period have become sticky and unplayable. But this transcription show is fine. 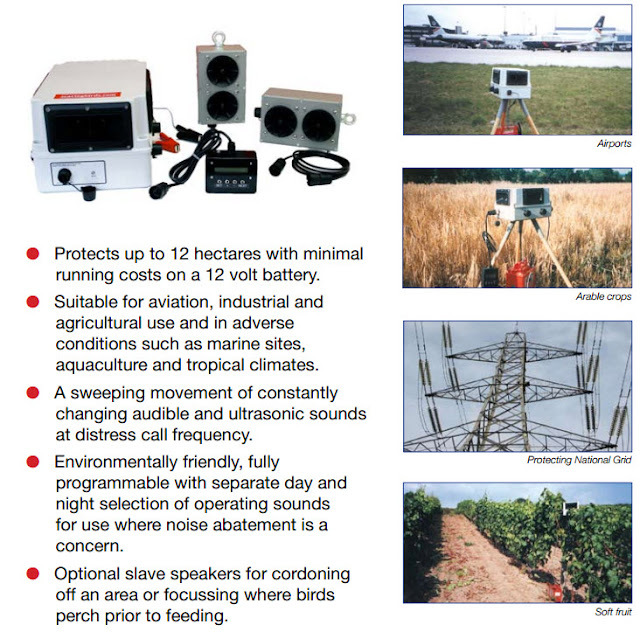 It deals with recent violent solar activity and its effects on shortwave radio reception. And we also here from Wolf Harranth (pictured) who reports on one of the few cases of pirate radio in Austria. Always been amazed at the Austrian monopoly maintained by the ORF. Antennas often got a lot feedback from listeners, especially when we went outside to talk about how to set up an effective aerial like a T2FD. Actually that antenna I am describing is still hanging in the garden, though I am doing much less listening on it than I was then. The programme also examines changes coming to Radio Norway International. Do you remember their weekly programme in Spanish? More from the Media Network vintage radio archives. There are several hundred on line, put up as a public service. Why? Because they actually tell the story of international radio broadcasting from its origins in the 1920's up until rapid decline at the end of the 1990's. For most of us, it's great nostalgia. This is a news orientated programme making use of a full postbag. We did a lot of reporting about shortwave receivers on Media Network, broadcasting rather lengthy reviews over the air. Nowadays, the web would be a much better medium. But it wasn't fast enough in the 1990's and only a small proportion of the audience has access.PC computing in a slump - looks like what's happening in 2013 is exactly the same as when we made this programme in April 1997. Shortwave radio dealers were closing. Remember Gilder Shortwave? We discover what is new about the Drake SW-2 receiver. We report that Radio Netherlands use of 1440 kHz (the great 208 from Radio Luxembourg) is being extended over the summer period. Andy Sennitt is trying to solve a Tanzanian mystery. Lou Josephs reports on improvements to broadcasters websites. Victor Goonetilleke has been hearing both Angola and Costa Rica. We also talked about Radio Fax, 6220 kHz from Trevor Brook of Surrey Electronics. Trevor was trying to get an official licence to broadcast programmes. Looking through the archives again. And disovered this/. We did a special 2 hr webcast to celebrate the 1000th edition of Media Network in February 2000. We were rather ahead of our time because although we were streaming live into the web using a Real Audio server, we only knew that around 575 people were able to listen at any one time. We had none of the webstats that are available now. Glad I found the audio on a CD so we can share it again with the Media Network Vintage Radio audience. It is a marathon session....2 hours of greetings and links with listeners. Were you part of the celebrations? This is an edited edition of Media Network which was released on transcription to other radio stations on 11 Jan 1995. In the light of the recent revelations. by Edward Snowden about espionage currently conducted by the NSA and UK GCHQ, this programme from 18 years ago is rather tame. Spies were expected to sit infront of shortwave radios to take down a message on a one time pad. We talk to spy numbers specialist Simon Mason who made a lot of recordings in the last part of the 20th century and also knew where to find these strange voices. Found a folder of Media Network episodes which have not been heard before in the Vintage Wireless Vault. A Media Network special from late 1997 focussing on longwave broadcasting. 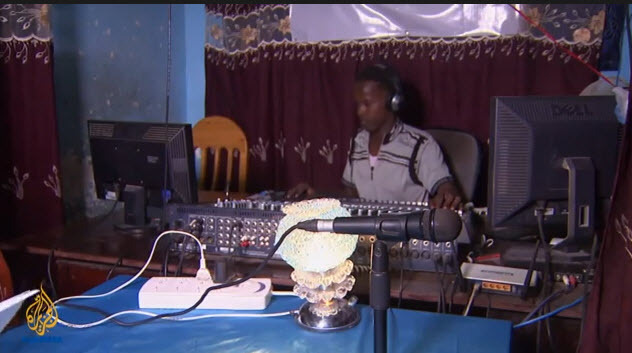 We also profile the Christian broadcaster ELWA in Monrovia, Liberia. Really glad I kept these radio programmes which were recorded in Australia and New Zealand in 1999. The first programme explains how Radio Hauraki and BBC World Service operate in New Zealand. We also visited the brilliant George FM when it was guardband micronetwork. It is clear that NZ, even today, isn't interested in digital radio. We also visited Sydney, Australia to record a great edition of the programme with Mike Bird. And this programme is also relevant. It was a tribute programme we made to New Zealand shortwave listener and broadcaster Arthur Cushen. The second half of the programme includes some amazing recollections by Arthur himself, especially of the war years. It doesn't seem like nearly 16 years ago that Arthur T Cuhen passed away. He was probably one of New Zealand's most famous shortwave listeners, having made his hobby of radio listening into a career from the 1960's onwards. He reported regularly for magazines and radio stations, including Radio Netherlands DX Juke Box and Media Network. We broadcast this tribute programme in which I tried to mix tributes with some fascinating stories told by Arthur himself. While we recorded his contributions for the programme he would often reminisce. He also had made excellent recordings of the Russian invasion of Czechoslovakia even though he was monitoring the events in Prague on the other side of the world. He often spoke of his wife Ralda, who was his childhood sweetheart and faithful companion. They lived at 212 Earn Street in Invercargill, New Zealand - an address that was often read out over dozens of international radio stations. I was struck by his picture perfect memory in which he could recall his work for the New Zealand Security Intelligence Service during the Second World War. He could hear stations in Japanese occupied Singapore and Indonesia, as well as Tokyo. They regularly broadcast the names of Allied Prisoners of War, which Arthur would transcribe by hand (there were no tape recorders) and pass on the message to grateful next of kin. Arthur was born with poor eyesight which gradually got worse in the course of his life. He not only did a lot of work for the shortwave radio community, he was also extremely active in local groups for blind and partially sighted in the South Island of New Zealand. This programme is a celebration of Arthur's contribution to a very important time in international broadcasting. It was broadcast in September 1997. Bit of nostalgia in this post, triggered by a talk I just gave at the University of Bedfordshire on the future of radio. I was actually struck about how some parts of radio have moved at a very slow pace compared to their video counterparts. In the summer of 1997, Diana Janssen and I spent the best part of a week in Silicon Valley. This was a period when Netscape was hot, and Google had yet to be launched. We made two radio shows for Radio Netherlands from San Francisco and Palo Alto. Not bad, bearing in mind there was really only enough budget for gas. We first spoke with Spencer Reiss, who at that time was working for Wired Magazine in their SFO offices. He discusses the future of media platforms and how things are converging. He turns out to be spot on! The second part of Media Network's safari into Silicon Valley 16 years ago. So what's changed in Palo Alto? Just about everything. We start off with a visit to the Philips Multimedia Center on Sand Hill Road, on the outskirts of Palo Alto. It was originally set up as a outpost of the Philips Research facility Natlab in Eindhoven. But they quickly discovered that consumers in San Francisco were 3-4 years ahead of consumers on the West Coast of Europe. So it quickly became a consumer test facility. At the time of our visit they were testing their equivalent of the Palm Handheld computer and an early smart phone. In the end I believe that with Philips' shift away from consumer electronics and more towards healthcare, the facility in Palo Alto was shuttered. We also drove up to Redwood City to meet the head of Grundig USA. He was bullish about the future of shortwave radio - and had developed a great business selling portable radios through Sharper Image, airline catalogues and camping magazines. I also found this related programme where we interviewed Professor John Campbell about how multimedia would be by 2010. As ever, John was spot on with his predictions. This was broadcast on October 31st 1996! I listen to radio in two ways. About 25% is live. There's a wifi radio on in the kitchen for most of the day. And it is listening to BBC Radio 4. But all the rest of my listening is to on-demand speech material, either poadcasts of specific feature programmes or podcasts from a select number of outlets. I love the downcast app because it is platform agnostic. If it is video, it plays video. If its audio, then you just get that. The content plays out programme by programme. James Cridland tipped me to a new app in the Apple Store, caled swell, which would be ideal for the car or train. It takes your favorite material and plays it continuously, rather like the NPR Infinity player. Except that it is not limited to NPR content. Love the promo for it. Pity it is restricted to the US for the time being. They need to look at the success of Vod.io and work something out. Eurovision - Is their only vision a television? Very, very concerned about this video made by European Broadcasting Union at a recent strategy awayday for managers. Assuming it does represent what these broadcast leaders are thinking, then it is no wonder that many public service broadcasters are collapsing. Note how no-one mentions the audience. It's all about them (the public) and us. And so, ultimately, public service will become irrelevant. The only person talking sense in this video below is futurist Gerd Leonhard. Poorly edited...I can't believe this has been made by the world's largest and richest broadcasting organisation. Can you? The title of this next video is EBU faces 2020 united. I don't come to those conclusions at all. The more I dig into what's happening in the high-tech world, the more I am convinced that science is indeed the next rock and roll. It's starting to have the most powerful stories. And the best paying jobs. The world won't be saved by the next Facebook. It will be engineers that gets things done. Which is why it's such a privilege to be part of the team that's building a world class accelerator in the South of the Netherlands. The campus is clearly catching the storytelling fever too. Ah, remember TV anchors? Er, not really. Now there's a dying art? I fear the trailer for Anchorman 2 may be funnier than the film which follows. That was certainly the case with the first film. I remember being amazed that Holland kept its continuity presenters in vision for so long. The arrival of commercial TV, much of which was played out by machines finally persuaded the public broadcasters in the Netherlands that you didn't need someone to introduce the next programme. I remember visitors from abroad wondering why it was needed, especially on camera. BBC continuity has always hidden behind the idents.